Having a Special Needs Friendly Halloween - I Love ABA! 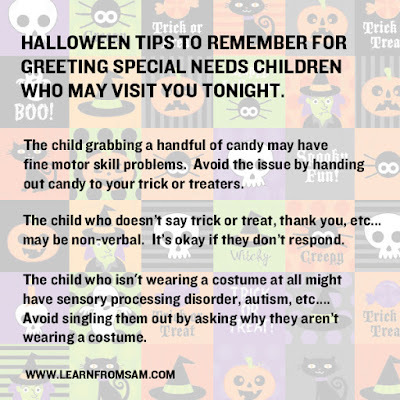 Halloween is rapidly approaching, and for anyone with special needs children this can be a time of anxiety and worry, as you wonder if your child will be able to participate in the various parties, events, and trick or treating. Here are some tips specifically for successful trick or treating, although some of these tips can be used for any Halloween event. 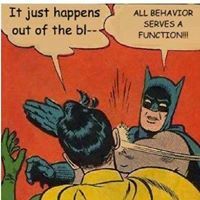 These are things I have seen work with various clients over the years who had a variety of behavioral concerns (not just Autism). Preparation - So maybe you think getting ready for Halloween starts on October 31. Silly rabbit! Thats not true at all. My rule of thumb? At least one week before the event, start preparing your child for what will happen. In language they can understand, explain what you will do, where you will go, and what they need to do. Practice what happens when you trick or treat, and make this as real as possible. I suggest visiting a friends home, have your child knock, have your friend open the door, etc. The more real the practice, the better prepared your child will be for the real event. Also, part of preparation includes letting your child know behavioral expectations. For example: "I expect you to stay with me, to use walking feet, and to keep your costume on". The Costume - You know your child, so you are already knowledgeable of their sensory/tactile sensitivities or dislikes. Maybe the face mask isn't such a good idea, and ditto on the cape with the string that cuts into their neck. If you buy the costume in advance, you can try it on your child to make sure the outfit is something they find comfortable and easy to move around in. There is also the option of editing the costume in order to remove whatever your child doesn't like about it. Maybe they want to wear the Frozen (Elsa) hair braid, but refuse to put the dress on. Okay, who cares? Involve your child in selecting the costume, as well as communicating to you (whatever their mode of communication may be) which parts of the costume they do NOT like. Look for local special needs friendly events - In addition to (or maybe in place of) trick or treating, consider looking for local events that are intentionally welcoming to individuals of varying abilities. These may be labeled as "special needs friendly", "non traditional", or "sensory friendly". These events are often smaller (think: less crowds), not as focused on candy (which some special needs individuals can't eat), and are more focused on activities and play (think: hold short attention spans). These events may be held at schools, churches, local therapy clinics, etc. Go to known areas 1st, or exclusively - Consider only trick or treating at the homes of people you know, and who already know your child: family, friends, etc. There are lots of advantages to skipping the homes of strangers: you can prep people in advance how to greet your child/how to prompt a greeting from your child, you can request your child be given healthy treats or toys, and your child may be more comfortable with the experience if he/she recognizes the people answering the door. Go in a group - This isn't the holiday to try and be brave and do things by yourself. Take someone with you. 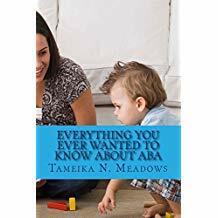 This could be your ABA therapist, the babysitter, your spouse, etc. Trust me, you will be happy to have another set of eyes on your child, and another pair of hands to help if things start to go badly. There will be lots of kids around, it will be dark (another tip: consider going earlier in the day rather than at night), and if your son is dressed like Iron Man, odds are there will be at least 15 other Iron Mans running around. Forget "Normal" - As I already said earlier: Who Cares?? So your child wants to trick or treat in her pajamas, or refuses to wear shoes, or is making loud "AHHHHHH-AHHHHHHH" sounds as you walk from house to house, or your 25 year old child with Autism wants to go trick or treating. Whats the problem?? Your trick or treating experience does not have to look like what the neighbors are doing. 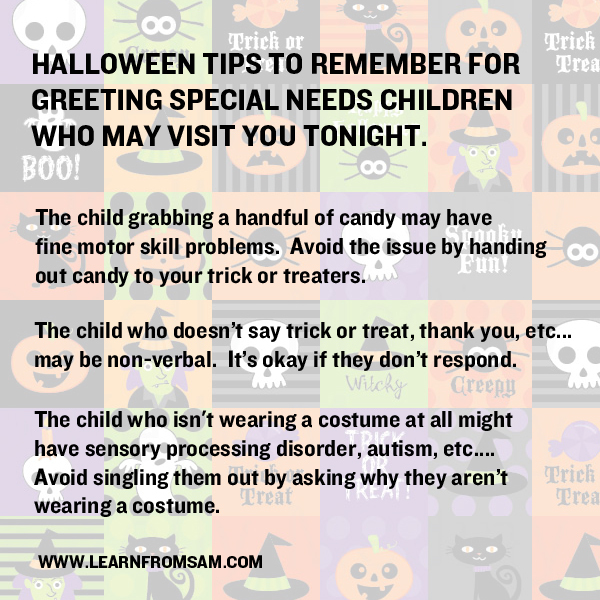 Just focus on making sure your child has fun, on what can be a very overwhelming and confusing night for children with special needs. Safety First - If your child wanders or elopes, consider placing them in a wagon or stroller. Before you leave the house, label your child somewhere on their costume with their name and a number to contact if they get separated from you. 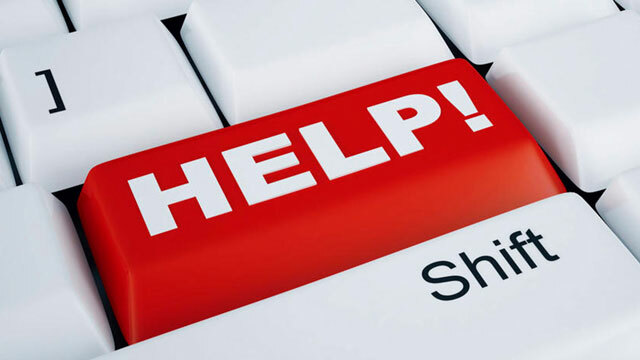 Take a photo of them in their costume so that in case of emergency, you have a photo of them in their current clothing. Again, for safety reasons I highly recommend going in a group. This is especially important if you will have multiple children with you. *Resource - The National Autism Association offers a free download of Thank You/I have Autism cards that can really be helpful for nonverbal individuals.